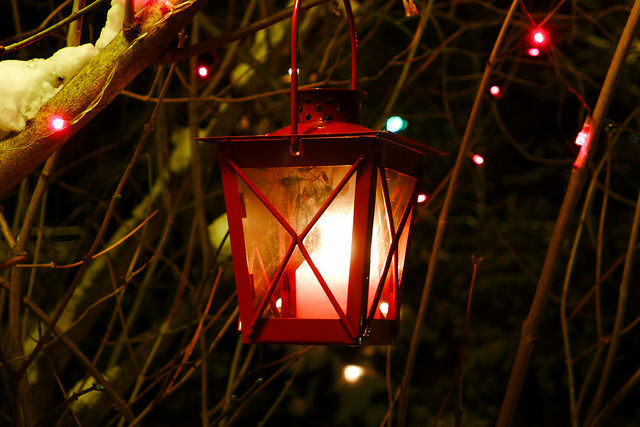 Are you looking for easy and affordable outdoor Christmas decorations that will stand out? Everyone hangs wreaths on the windows. To help your house stand out in a neighbourhood of wreaths, why not decorate the window sills? You will need extra-large Christmas ornaments in the colour of your choice and holly garlands. If you have very narrow sills, you might want to use some Command Hooks to attach the decorations to the windowsill. Instead of glass balls, you can save money by using a collection of pine cones instead. First, lay a garland of basic holly across the back part of the windowsill. To add glow, you can buy pre-lit garlands. Then, add shiny decor to dress things up. Extra-large Christmas ornament balls are a gorgeous way to set off the windows of your home. You can choose giant balls in one colour, or you can use every colour of the rainbow. It is up to you! Alternately, you can add pine cones and ribbon bows for a splash of colour. 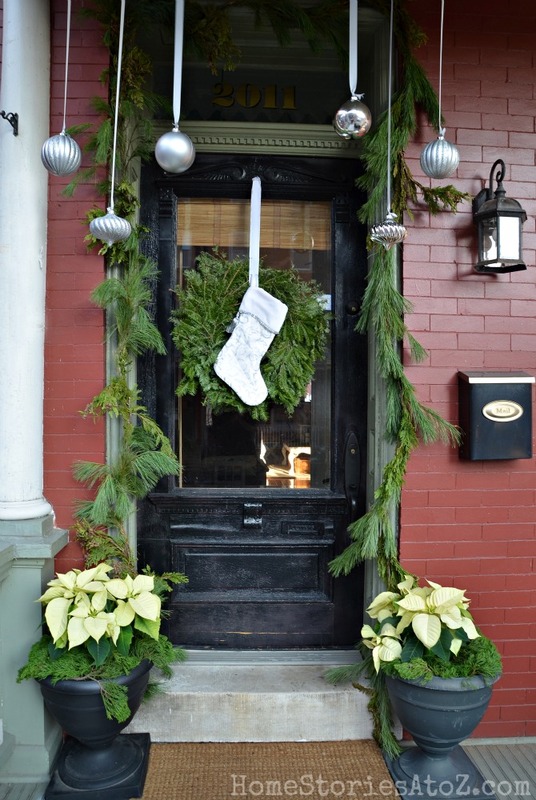 This idea is a less costly way to get Christmas cheer across the front of the house. First, the pre-lit garlands cost about $20 for a set of two six-foot lengths. Second, the over-sized Christmas ornaments cost about $20 per ten ornaments. Pine cones and ribbons can be found for a little less. For a six-foot windowsill, you probably want ten ornaments or pine cones. The total cost per window will end up being about $30. Many people love using multi-coloured outdoor Christmas lights on the outside of their homes. However, choosing just one or two colours can really set your house apart. Blue, white, and silver lights give the idea of a wintry, snowy glow. Red and green lights are a classic choice. Using a yellow or ivory lighting scheme will give the mood of a candlelit evening. This display can use many different types of outdoor Christmas decorations. Every display should use lights, maybe some bows, and, if you like, a Christmas tree. Coordinate the lighting scheme across all of the decorations. Choose a white or silver outdoor Christmas tree next to your front door for a winter theme. Choose a classic green tree for red, green, or ivory themes. Add bows in coordinating colours to set off your colour scheme. This idea can be as expensive or cheap as you want it to be. If you go all out for Christmas, cover your whole home with lights. If the budget is tighter, focus on one area, like the front door, and make it pretty. Each strand of lights will cost about $10. A package of two large coloured bows can cost about $5. A small outdoor tree may cost as little as $30. For a simple display, you can pay less than $50 for the decorations. For a more lavish display, you could pay $150 to $200. Many items that you may already have on hand for camping or outdoor fun can be reused for Christmas decorations. Oil or battery powered lanterns, a plaid tablecloth, and a small tabletop Christmas tree can be used for a front porch Christmas display. You can use the table on your front porch as the setting. Cover the table with a red plaid cloth or blanket. In the centre of the table, place a small Christmas tree or a few poinsettias. Place an oil lantern or two on the table. You can hang them from the porch eaves if you prefer. If you don’t have a lantern, candles will do nicely as well. These Christmas porch decorations can be created with things you may already have. However, if you have to buy each item new, the oil lanterns will cost about $10. The tablecloth can be found for about $20. Poinsettias or a small Christmas tree will cost about $30. The entire cost of a rustic, outdoorsy front porch display can be about $60. Those who walk in your neighbourhood will be more familiar with your mailbox than your front porch. Add some Christmas cheer to the mailbox with a few simple items. You will need red and white ribbon, Christmas greenery, and a few large, colourful bows. It’s best if the greenery includes holly berries and pine cones as accents. 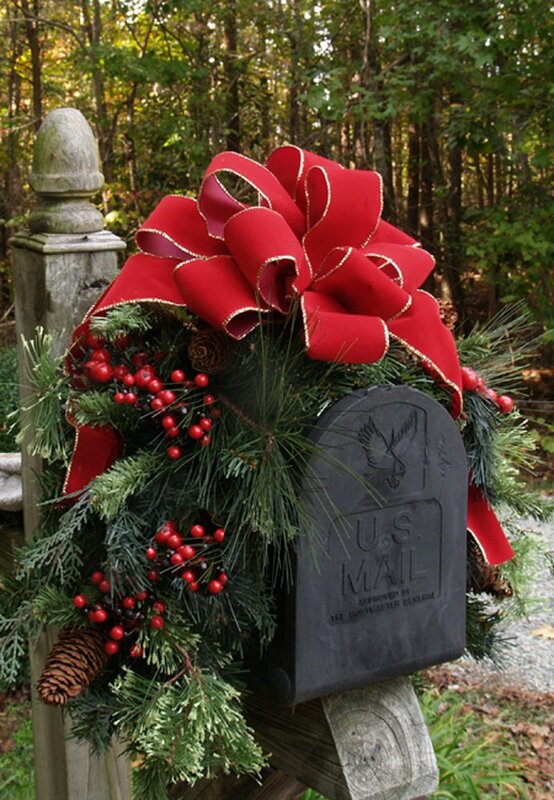 Wrap the ribbon around the post in a spiral to give a candy cane look to the mailbox post. Drape the garland over the top of the mailbox so it flows over the top and down the sides of the mailbox. Add ribbon to the top of the mailbox and to the post immediately under the box. 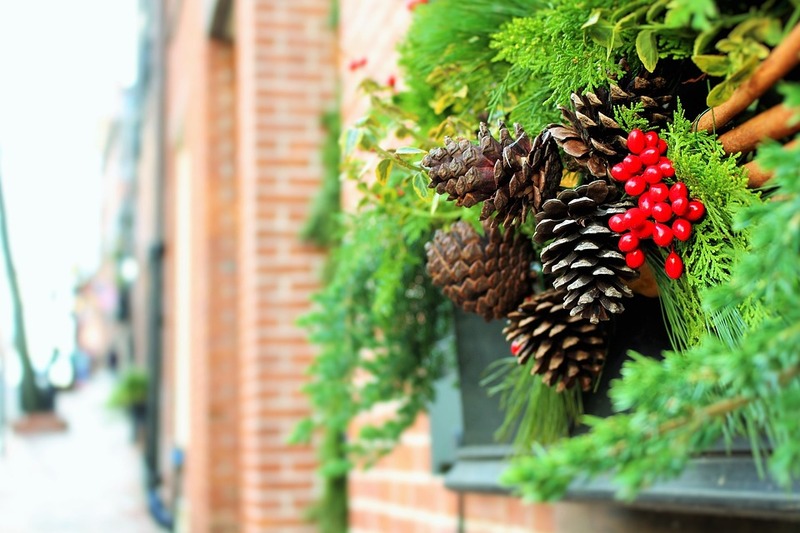 This simple outdoor Christmas decoration is an easy and cheap way to add holiday cheer to your home’s exterior. The ribbon will cost about $8, the garland may cost no more than $10, and the bows will be just $5. The total cost for this outdoor Christmas decor will be about $23. Whether you live in an area that gets lots of snow or none at all, snowflakes make elegant outdoor Christmas decorations. Pairing them with white and red Christmas lights really sets them off. Give your home a winter wonderland vibe with just plastic snowflake ornaments, a garland of greenery, and a simple strand of white lights. Mount the lights along the eaves of your home along with the greenery. You don’t have to have strands heavy with lots of large bulbs. This look is best with a light sprinkling of lights. Hang the snowflake ornaments from the light strands. 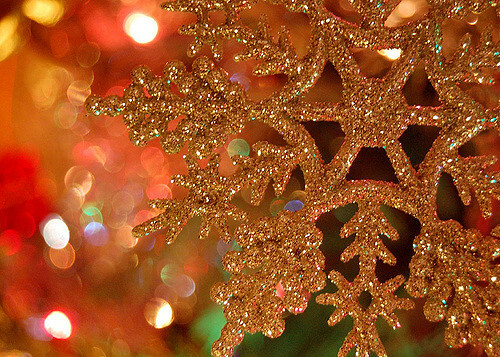 If you are lucky enough to have glittery snowflakes, your home will sparkle and shine in the night. The garland will cost about $10. The snowflake ornaments will be about $10 for a set of 24. The light strand will cost about $5. This is a very inexpensive way to deck the halls! If you are lucky enough to have an exterior door with panes of glass, you have a lovely place to hang snowflakes. 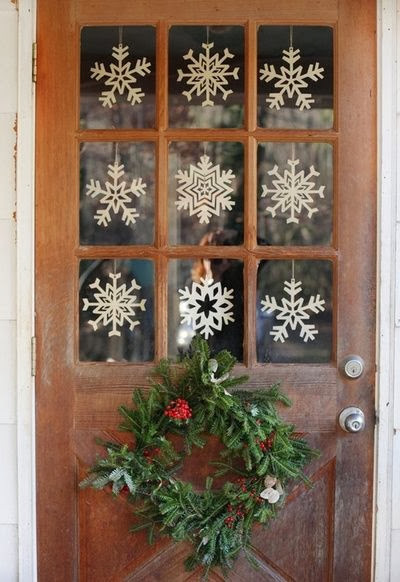 Decorate your door with a simple wreath and some small plastic snowflakes to add joy to the entrance. For this impressive outdoor Christmas decoration idea, you just need a few simple things: plastic snowflake ornaments that are a bit smaller than your glass panes, string or yarn, thumbtacks, a Command Hook, and a small wreath. String the yarn through the snowflakes and hang them on the door panes with thumbtacks. Mount the Command Hook according to package instructions. 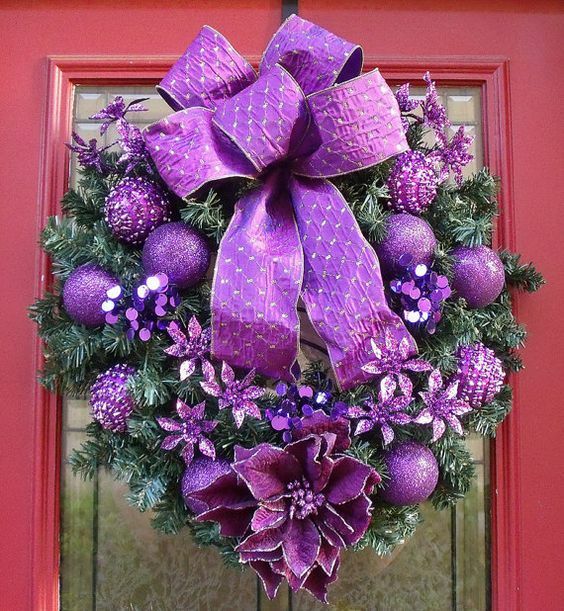 Hang the wreath below the glass portion of the door. The plastic snowflakes can be found at $10 for two dozen. Thumbtacks and yarn will be about $2 together. You may pay about $15 for the Christmas wreath. The Command Hook will be about $3. For about $30, you will have a fine decoration for your front door. Celebrating Christmas need not be a glamorous and elaborate affair. Some people just have simpler tastes. If that is you, embrace the simplicity. 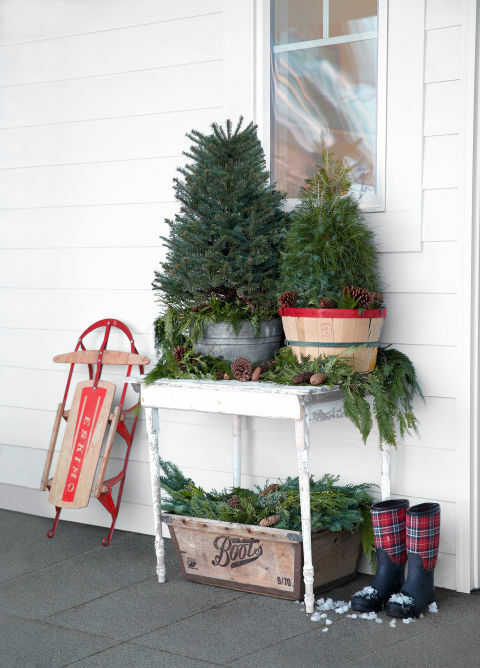 Place a couple of potted evergreen trees in festive baskets or a metal tub near your front door. Arrange pine boughs and a few pine cones artistically around the trees to set them off. 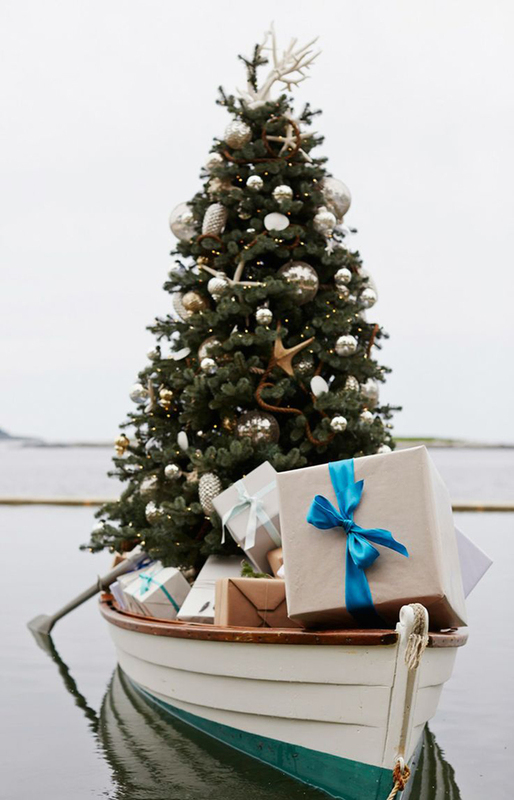 A small basket of boughs, pine cones, or firewood can declare that you prefer an elegantly understated Christmas. Live evergreens may cost about $20 each at a garden centre. You will be able to plant them in your landscape in the spring. Baskets cost about $3 each. A galvanised tub can be found in farm and garden centres for about $10. Pine boughs may be found for $15. The firewood will cost about $10 for a small bundle. The total cost for simple, elegant, and classy porch decor can be about $38. Christmas is a time to welcome guests. 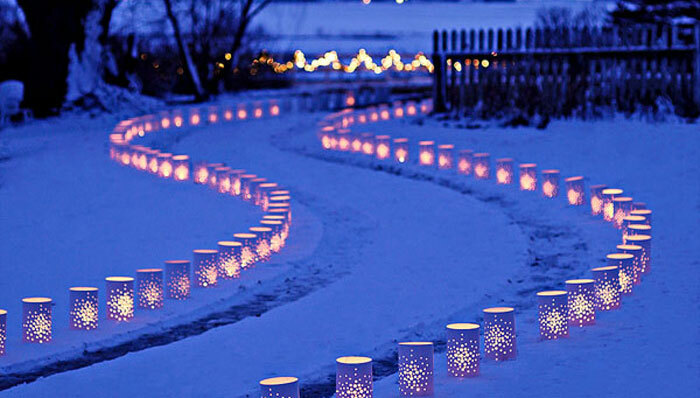 Show them the way to your front door with luminaries. Your guests will be in the Christmas spirit before they ring the bell. This is a great idea for when you host a Christmas party. You will need luminary bags. These can be found in several different patterns. Snowflakes, angels, and stars are just a few of the themes for luminary bags. You will also need battery powered tea lights. Do not use candles since these can be a fire hazard. Set the bags out to line the sidewalk. You can also place them on your porch or steps. Your home will be swathed in glowing Christmas cheer. The bags cost about $15 for 24 bags. The battery-powered tea lights cost about $15 for 24 lights. The total for this outdoor display can be as little as $30. You may already have many things needed to make pretty holiday displays. 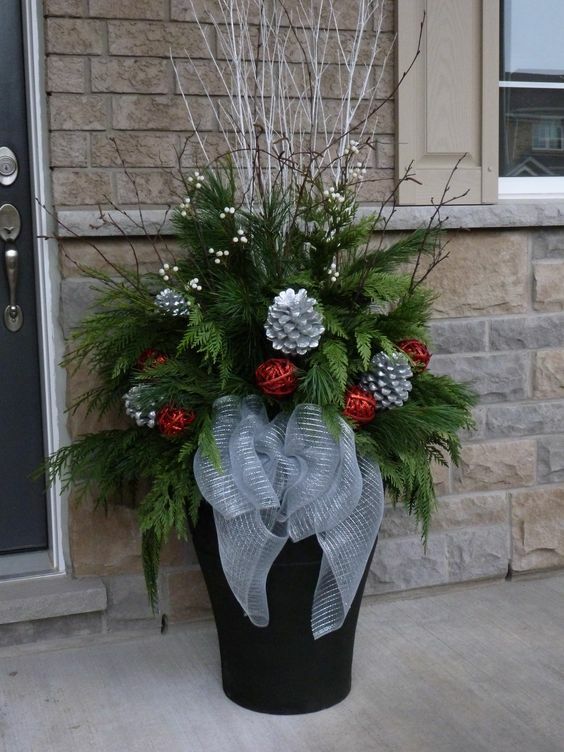 Those planters that you fill will spring flowers can be used for Christmas. All you will need for this idea is pine boughs or holly branches and some ribbon. You can also add pine cones or other small accents. Remove any dead plant matter from your front porch planters. Bundle your pine boughs or holly branches by tying a ribbon to the cut stems. Place the branches in your planter, arranging them nicely. Be generous with your boughs to make full, lush decorations. Add a few accents like pine cones or coloured Christmas balls. These planters are not pricey to make. The pine boughs may cost about $15 for a bundle. The ribbon is about $5. The accents will also cost about $5. Your total for this idea is about $25. Even if you are not a crafty person, this is an easy homemade idea for you and the kids. 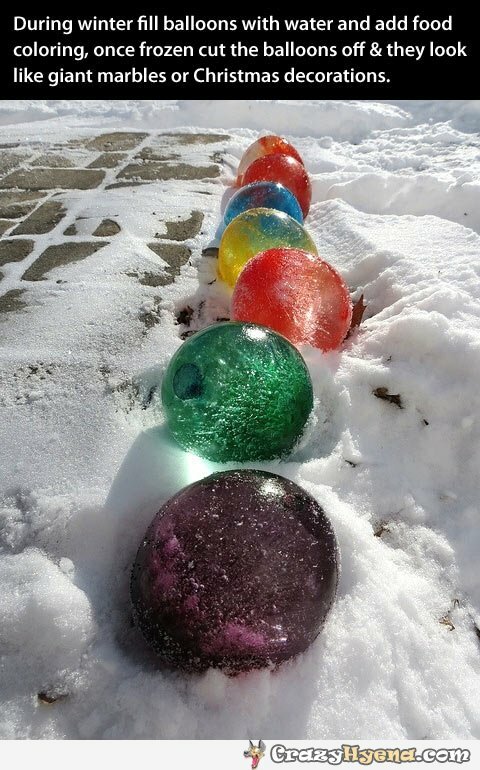 You can add giant, frozen, glowing marbles to your walkway with just a few simple and inexpensive items. You will only need extra-large balloons, water, and food colouring. Also, you will need battery powered tea lamps. You need one for each glowing marble. Fill the balloons with water and add food colouring. Clear marbles are lovely too. Put the balloons in the freezer or outdoors if it is cold enough. After a few hours when the marbles are firm, gently cut away the balloon. You should have an outer shell with liquid water inside an icy globe. Break away a small area and drain the water out. Put the tea light in the hollow. You can buy a package of balloons for $2. Food colouring costs about $3 for a package. Tea lights will cost about $15 for a dozen lights. The total cost for this glowing display is about $20. Apples come in red and green, two classic Christmas colours. Rather than using holly or pine cones as accents, use apples. You can find many apple decorations to make your home stand out. 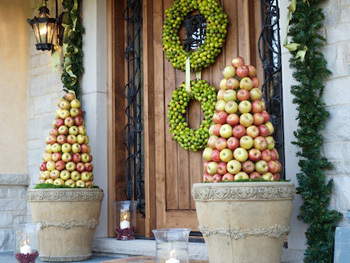 Apple topiaries can be placed next to the front door. Apple wreaths hung on the door will be uniquely cheerful. If you cannot find these in the stores, large baskets of apples can be placed near the door. You could also add fake apples to existing wreaths with hot glue or wire. Ready-made apple topiaries can cost about $50 each. Set one on each side of the door. An apple wreath might cost $25. The total to deck the halls with apples would be about $125. 12. I’m Dreaming of a Purple Christmas? Everyone uses red, green, gold and silver in their Christmas decor. To be different, choose an offbeat colour. Purple, pink, lime green, and turquoise can all be festive too! To decorate in a different style, you’ll need ribbons, wreaths, and beads. 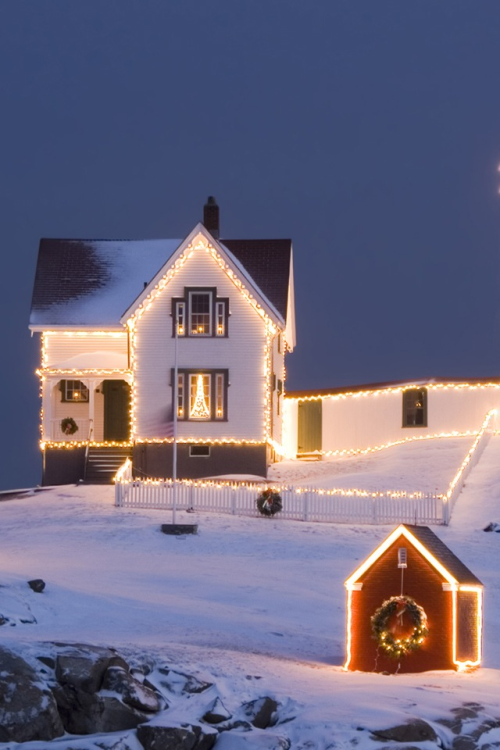 White lights can set of an unusual colour if you can’t find the correct colour lights. Wrap the porch posts with ribbon and beads. Add a strand of white lights to the eaves. Hang a wreath that has ribbon in your choice of colours. The ribbon will cost about $10. The wreath will add about $10. Beads are $5 for two strands. Each light strand will cost about $5. The total for this idea is about $30. Who says that sleds and wagons are the only way to add Christmas cheer? If you have a hobby, use things you already own to express yourself. Take your bicycle and add ribbon and lights to make it festive. If you own a boat, drag it to the yard and fill it with greenery. Line it with lights to help it glow. Whatever your passion, bring it to life for the holidays. Set out a collection of sports equipment with ribbons and holly tied to it. Even better, this idea uses things you already have on hand. Just dress them up with ribbons, lights, greenery, and bows. The ribbon for this project can range from $10 to $35 depending on how much you need. The lights should probably cost no more than $15. The greenery and bows will probably cost about $20. This idea can cost as little as $50 or more. If you don’t want to climb a ladder to decorate your home, simply dangle Christmas ornaments from the eaves of your home. For this project, you only need colourful ribbon, Christmas ornaments and Command Hooks. Thread ribbon through the ornaments, using varying lengths of ribbon. Tie a loop at the end of the ribbon for hanging. Attach the Command Hooks to the eaves of the house. Hang the balls from the hooks. This idea will only cost you about $25. The ornaments will be about $12. The Command Hooks will be about $8, and the ribbon costs about $5. 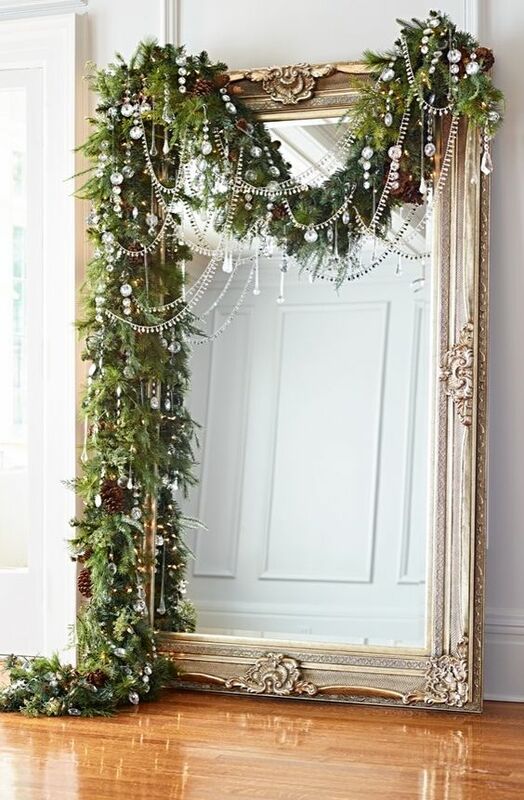 Using a mirror on your front porch will add elegance and drama to your outdoor Christmas decorations. For this project, you’ll need a large mirror. It’s best if the mirror has a fancy, golden frame. Also, have on hand evergreen garlands, crystal beads, and a strand of mini-lights. Prop the mirror on end against the porch wall. Drape the greenery across the top and down one side. Add the beads and lights too. Add beads lavishly so the display is rich and opulent. Your total cost for this design will be about $180. If you don’t have a mirror, it will cost about $150. The garlands will cost about $10. The lights will cost about $10, and the beads cost about $10. You can save money if you already have a mirror at home. For more festive ideas, check out our Christmas page. Check out these 10 easy and cheap DIY Christmas craft ideas for kids to make and will also help you spend more fun time with your kids! In this guide, we share 10 clever DIY Christmas decorations to make your holidays merry and bright on a budget and in quick time! Christmas is coming again and it’s time to decorate your home for this festive season. Kitchens, bedrooms and even the exterior of your home could be lightened up with some festive decorations. This Christmas. We show you how with these 10 fun and affordable eco-friendly Christmas decorations you can make at home. With a little creativity and a couple of materials, let’s bring your favourite characters and themes to your home this Christmas and continue to spread the festive cheers to all visitors.